911uk.com - Porsche Forum : View topic - 991GT3's dropping?? 911uk.com Forum Index > 911 GT, R & RS Models (1973 - current) > 991GT3's dropping?? Posted: Sat Aug 18, 2018 8:32 am Post subject: 991GT3's dropping?? Just had a quick shufty on PH and the 991 GT3's market seems to have cooled off. And there's loads of them! I've been following prices and this last month or so the values have taken a big 'hit', could be lots of factors driving it but sales are not just slow they're virtually at a standstill. The book value on a lot of 911's has dropped dramatically, some up to 5% just in the last few months. I looked at a really nice GT 3 a few months ago, started at £129,995. Eventually it sold and the advertised price was £115,00, what the actual selling price was who knows but when I spoke to the seller (Trade) he was desperate to sell as I think he thought he would make money on it going up but it didn't. It's def a buyers market, I dare say the really good cars will still hold their money but they'd have to exceptional in this market. There's a lot of uneasiness in financial markets and what with that and the U.K. situation people are just saying 'I think I'll wait and see what happens'. Good time to buy, if you've got the nerve and the cash spare! I too had been considering the man maths on this. Not a lot seems to be shifting at the moment, but I don't think prices have dropped though. BCA have a 991 GT3 coming up for auction, four years old, 15k miles if I remember correctly, would be interesting to see what it goes for. Posted: Sat Aug 18, 2018 3:40 pm Post subject: Re: GT3's dropping?? Any clubsport GT3 with no stories will be a good long term prospect. The BCA car has 19k miles and is in from Sytner Group. It’s a Grade 2 so should be in pretty good nick, but given that Sytner Group has Porsche Approved dealers I would be sceptical as to why it’s going through BCA. Interestingly its first MOT was due (and done) in October 2017 and it was MOT’d again on May 3rd this year with 19,137 and then again on July 12th with 19,195. No advisories on any MOT’s. The cynic in me may suspect that it was sold in May with a full MOT but for whatever reason was returned / rejected for a refund and then sold again in July with another fresh MOT and has since been rejected again.... A one way ticket to BCA just passes the headache to someone else with no comebacks whatsoever. I could of course be wrong and it all could be perfectly innocent (people's circumstances can change very quickly), but that’s an expensive risk for someone (else) to take. I've also noted the drop on GT prices. 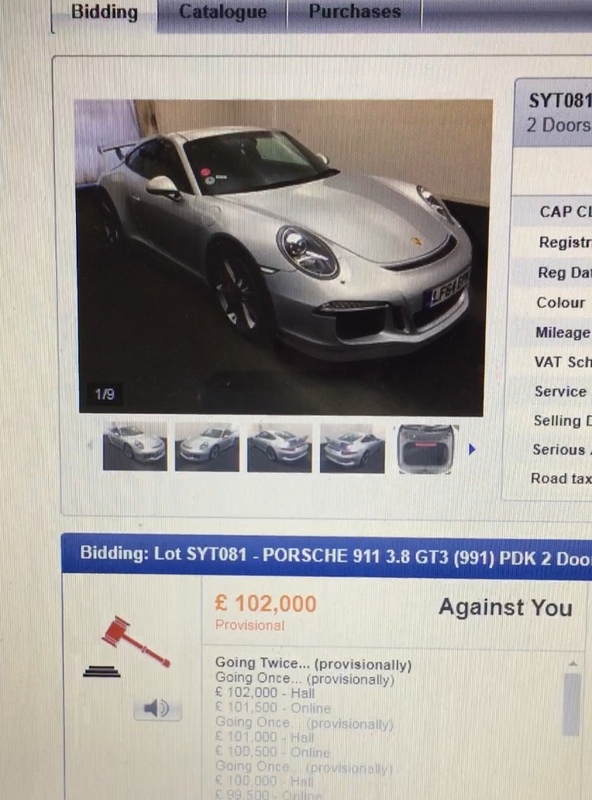 Even a 997.2 GT3RS at an OPC is sub £150k. The 991 market is getting smashed by all those who got allocation for the 991.2 GT3 by giving up their 991.1 GT3 back to OPC. Release of 991.2 GT3RS and GT2RS will no doubt impacting values as owners trade in their cars. Secondly with Br Exit looming, and uncertainty in the air, perhaps some have thinned out their holdings in cars just in case things go bad. I've seen a few extra high end homes on the market £2.5m+ on the market recently so perhaps this isn't just the car industry. Wouldn't a none OPC service in the book (JZM etc) or none standard parts see it being punted to the trade? Oops, forgot to mention the services. It's had two services, both at Main Dealer (presumably in 2016 and 2018 as per schedule). Two MOT's so close together shouts "rejected and re-sold" car to me. It would be interesting to see if both MOT's were done at the same place (I'm going to the MOT station on Monday so will ask them to look it up if I remember). And with so many 991's in the OPC Approved network, what difference will one more make. I smell a rat! Carzana suggets it was listed last month at £119k but doesn't say where. I've also noted the drop on GT prices. Even a 997.2 GT3RS at an OPC is sub £150k. * The numbers of 991.1 GT3's sold. * The numbers of 991.2 GT3's that have been flipped, many through the dealer network. With all the prices compressing like this on the 991 range, the pressure will also be reflected in the 997 and 996 market too. Aside from actual cost of finance, the other factor for cars under £100k is the cost of insuring them on track. From what I've been told by Mannings, the underwriters want twice the premium to insure a £100k car at the Nurburgring, than a £99k car. Just to follow up on the BCA car (LF64EPK). It was MOT'd at Porsche West London on 12th July (10 weeks and 58 miles after its previous MOT in May). Had a ride in a 991 GT3 RS today - what a car! Owner has never even driven the car himself - well... he only has about 95 cars!